Dinty W. Moore’s books include a popular spiritual inquiry, The Accidental Buddhist, and an award-winning, nontraditional “generational memoir,” Between Panic and Desire. His new book—his sixth—is Crafting the Personal Essay: A Guide for Writing and Publishing Creative Nonfiction (Writers Digest Books, 262 pages). Indeed, Moore, head of creative writing at Ohio University, discusses many types of essays, including: contemplative, memoir, nature, lyric, spiritual, gastronomical, humorous, and travel. To show how they work, he dissects some, inserting commentary in places; this includes some of his own work, and throughout the book he includes parts of an essay he’s currently writing to show his thinking and decisions as he tries to practice what he’s preaching. The essay-in-progress is about walking, specifically Moore’s quixotic attempt to walk to a campus in Boca Raton, Florida, where he was a visiting writer, only to find himself almost getting squashed like a bug on six lanes of concrete. While poking fun at himself, Moore exposes the unfriendliness of much of suburban America to walking and to human-scale, neighborly life. His enjoyable essay is printed in full at the book’s end. Crafting the Personal Essay also propelled me belatedly after two great essays I hadn’t read, Virginia Woolf’s famous “The Death of the Moth” and Richard Rodriguez’s poignant study of cultural assimilation “Mr. Secrets,” both available online through google searches. it interesting and inspiring. It makes me want to try writing different types of essays than I’ve attempted and to develop new skills, to grow. Like all of Moore’s work, it is characterized by a light touch, good ideas, a wry sensibility, and a deft concision. He answered some questions for Narrative. RSG: What did you learn writing this book? DWM: I was forced to learn much more about the personal essay tradition than I knew going into the book. My introduction to creative nonfiction, like that of many people who discovered the genre fifteen years ago, was focused more on memoir and literary journalism than it was on the British essay tradition or on Montaigne. But I’m not too old to learn new tricks, it turns out. 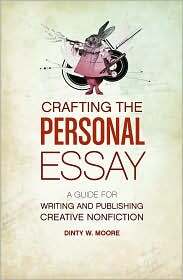 RSG: I realized in reading Crafting the Personal Essay how narrow my definition of the essay can become. But you discuss many approaches within the genre, ways to tell stories and entertain that rely on humor, observations of common experiences and foibles, clever insights, fleeting feelings, research and reporting. How does a writer remain open to the possibilities of the form without getting overwhelmed by them? 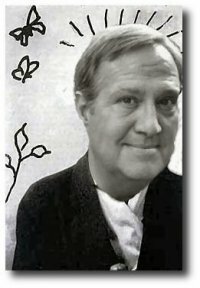 DWM: I’d advise that a writer examine the familiar patterns he or she finds in her writing—I am always funny, I am always ruminative, I am always logical, whatever—and gradually try to introduce new modes into works in progress. You don’t need to juggle the whole set of fifteen balls at once, but you won’t grow as a juggler if you stick to the same three balls every time you take the stage. Eventually, putting research or reporting into your nonfiction—even if you haven’t been doing it up to now—will become a common move in your repertoire, one that you can call on whenever needed. RSG: Much of your own work is characterized by pursuing something you notice that interests you, such as the explosion of the internet or the growing practice of Buddhism in America. You’ve leaped into the unknown with only an idea, and you’ve participated, interviewed, and traveled. Do you have any advice for writers who want to attempt such a fusion of the personal essay and old-fashioned reporting? DWM: Left to my own mental devices, I only have one or two interesting thoughts a year, and that’s not nearly enough to sustain a writing career, but I find that I can increase the number of interesting thoughts that I have by trying new things, learning new facts, visiting new places, attending lectures, getting lost in a zendo for five days. Sometimes the reporting, or observing, ends up in my writing, but at other times it just leads to a fresh thought – fresh for me, at least – and suddenly I have an idea. This has, as you pointed out, led me to a few book ideas, but it also leads sometimes to a 500-word essay. Keep the mind nimble by constantly throwing new experiences in its direction, in other words. I’m not the first writer or artist to note this, of course, but it sure works for me. RSG: There seems currently to be a surge of interest and enthusiasm for the personal essay. Great talents are experimenting, playing around, melding influences such as lyric poetry and the classical contemplative essay pioneered by Montaigne. Is this upwelling real from where you sit, or is this simply the effect of those with passion for personal nonfiction seeing what they’re looking for? DWM: I think you are noticing an actual phenomenon. This goes back to my earlier answer. New Journalists like Didion, Wolfe, Talese helped to create an explosion of fact-based literary writing in the ‘60s and ‘70s, and a few years later Lee Gutkind helped to popularize “true-story as literary narrative told cinematically” with his journal Creative Nonfiction, and suddenly there were dozens of graduate programs and hundreds of undergraduates classes springing up in creative nonfiction. Much of that activity focused on memoir until certain people started to say, “Wait, the genre is older than that, and there is more flexibility that that.” So in academia, at least, and in literary journals (but actually I think the phenomenon goes beyond that to commercial magazines and book presses), the field is in an opening-up phase, which is good, good, good, I think, for writers and for writing. RSG: You write, “Self knowledge is the true prize for the writer.” Could you elaborate a bit? DWM: Why do so many people devote themselves to writing, or to the arts in general? It is not the monetary rewards, certainly, or the support and praise one gets from one’s family when we announce our love for poetry or dance. No, we are drawn to art because it makes us feel more alive, makes us feel that we are experiencing and engaging life, makes us feel that we are looking at our lives and making choices based on our hunger and passion for understanding, rather than merely being dragged along by circumstances beyond our control. That’s what I believe, anyway. Nice article and interview, Dinty. Looking forward to seeing you at the 2010 Creative Nonfiction Conference in Oxford in November. Would this book make your top 10 list of books about/of creative non-fiction? Do you have such a list? I loved _Bird by Bird_ by Anne Lamott, mostly for her wry humour. I don’t have such a list, but this is right up there as a textbook for teaching essays. I’m writing a memoir and so am obsessed with book-length cnf and books about how to write books rather than discrete essays. And I have yet to decide whether this or Moore’s The Truth of the Matter would be a better textbook; I like it because it includes literary journalism, as well as personal essays and memoir. The many different types of essays delineated in the current book might help more in a class just on the essay. It’s the kind of book I will dip into periodically, too. Reinvigorates my love for writing essays and offers hope for their success. Can’t wait to read the book! I’ve heard good things about The Accidental Buddhist and was happy to read more about the author. Nice review of this craft book. I liked his advice to examine familiar patterns in our writing. I can’t wait to read the book. Moore is a great essayist, funny without being light-weight, and always insightful. Nice interview. I loved Moore’s last response about why we write. It makes me feel more alive too, but sometimes it’s good to be reminded. excellent opening, q and a. what delights about Dinty, his many suggestions, openness all art new, including writing; that’s an imaginative imagination, a greater part any writer’s written, not to mention his understanding (last answer) a writer’s quest, soul…thank you. I use Dinty Moore’s book Creating The Personal Essay to learn from, and also to teach from. I find that I can open to almost any page and find a good bit of wisdom about writing and lesson’s on the craft. One thing he does so well is reprints an essay (or part of an essay) then interjects what the writer is doing – he points to craft. It’s wonderful. I agree, Joy, and thanks for commenting. I have used his The Truth of the Matter to teach creative nonfiction and find the same thing. Dinty is deft. No fat, just lean red meat. So many texts are overwhelming—”complete,” yes, but unwieldy and intimidating to students.